Finally! 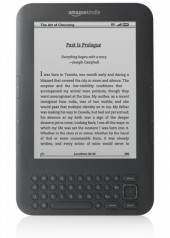 Kindle’s software update is almost here! We have been hearing talk about this new software update that will have real page numbers and a couple other improvements. The update is almost here! The update will be delivered via a Wi-Fi connection in the next few days. Kindle owners should be receiving a notice in their email about what to do. If you don’t have a Wi-Fi connection available, there are other instructions on how to transfer the update via USB. This entry was posted in News and tagged Amazon and Kindle books, Royalty news. Bookmark the permalink.